On a recent visit to our veterinarian to get shots for our cat I found this recipe on the waiting room bulletin board. After recovering from hysterical laughter, I obtain ed a copy from the office staff so that my wife could make it, which she refused to do. I took it to work and gave the recipe to a lady at work who loves cats. The pictures below show the results of her work. It doesn't look very nice, but it's actually quite tasty, so I decided to pass it along. 1) Prepare and bake cake mixes, according to directions, in any size pan. Prepare pudding and chill. Crumble cookies in small batches in blender or food processor. Add a few drops of green food coloring to 1 cup of cookie crumbs. Mix with a fork or shake in a jar. Set aside. 2) When cakes are at room temperature, crumble them into a large bowl. Toss with half of the remaining cookie crumbs and enough pudding to make the mixture moist but not soggy. 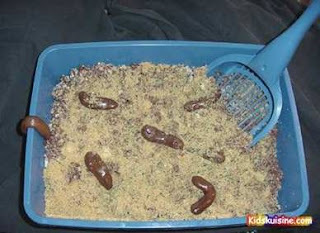 Place liner in litter box and pour in mixture. the blunt ends into slightly curved point s. Repeat with three more rolls. Bury the rolls decoratively in the cake mixture. Sprinkle remaining white cookie crumbs over the mixture, then scatter green crumbs lightly over top. 4) Heat 5 more Tootsie Rolls until almost melted. Scrape them on top of the cake and sprinkle with crumbs from the litter box. Heat the remaining Tootsie Roll until pliable and hang it over the edge of the box. Place box on a sheet of newspaper and serve with scooper. Enjoy! Lipstick in School -- Priceless!!! Van Halen to tour in summer of 07 ! Rock Hall of Fame 2007 ! Major Gas Leak In Manhattan ? Father says ‘Tigger’ hit his son at Disney park ! Texas Cheerleaders Gone Wild !